Glenn Greenwald is a blogger for the website Salon.com and a well-known critic of the Washington, D.C. Beltway establishment on both the liberal and conservative side. Prior to becoming a blogger for Salon, Greenwald was a constitutional law and civil rights attorney in New York. Greenwald is the author of two New York Times Bestsellers: How Would a Patriot Act? (May, 2006), A Tragic Legacy (June, 2007), as well as the book "Great American Hypocrites." Greenwald is famous for his lengthy polemical blog entries, as well as his scathing critiques of the mainstream media, United States foreign policy, legal and constitutional law issues, as well as government-sponsored manipulative propaganda and public relations efforts. Greenwald and his reporting dominated the news in the first weeks of 2013 when he reported in the Guardian information provided to him by Edward Snowden exposing massive, secret, global spying via NSA acquisition of online data on hundreds of millions of people around the world. 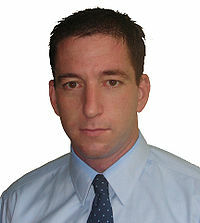 ↑ Glenn Greenwald Moves From Salon to Guardian U.S., organizational web page, accessed July 20, 2012. ↑ Glenn Greenwald announces departure from the Guardian, The Guardian, October 15, 2013 . ↑ Pierre Omidyar commits $250m to new media venture with Glenn Greenwald, The Guardian, October 16, 2013 . ↑ Freedom of the Press Foundation Directors, organizational web page, accessed April 15, 2019. Staff, "Glenn Greenwald's partner detained at Heathrow airport for nine hours", The Guardian, August 18, 2013. Glenn Greenwald, "Glenn Greenwald: detaining my partner was a failed attempt at intimidation", Huffington Post, August 18, 2013.